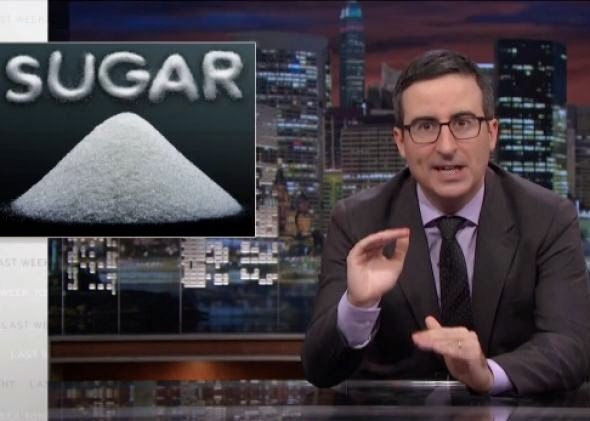 "We eat the equivalent of 75 pounds of sugar each year," says Oliver. "That's roughly Michael Cera's body weight in sugar!" Americans spend 2.2 billion on candy. The Big Food has convinced us sugar is a healthy alternative to fat. They're using the same tactics as Big Tobacco. Neuroscience is proving sugar has effects similar to that of cocaine. Mice on sugar lose a lot of its cognitive abilities. Sugar is a major link to understanding obesity, premature aging, diabetes, and heart disease. FDA wants added sugar labels but the food industry is fighting tooth and nail against it. Independent researchers observe links between sugar and obesity. Industry affiliated researchers find inconclusive results. It's hiding everywhere: beverages, crackers, salad dressings, breads, cereals, ketchup, frozen cocktails, sports drinks, beef jerky, turkey jerky, and the list goes on and on. One serving of Clamato has 11 grams of sugar, "so they clearly thought, let's improve the taste by adding sugar," says a glib John Oliver. There are many factors and culprits that lead to obesity but as John Oliver cleverly states, "Asking what causes obesity is a bit like asking who killed a first-grade class’s hamster. Sure, they all killed it in a way, but I think we all know one of them killed it the most!" Even the cranberry industry doesn't want you to know about sugar content. The head of Ocean Spray company wrote to the FDA, "cranberries are naturally low in sugar, giving them a distinctively tart, astringent and even unpalatable taste." John Oliver responds, "That's the head of Ocean Spray describing its defining ingredient as unpalatable. It's no wonder they want certain cranberry products to be exempted from the proposed 'added sugars' declaration. Which is tantamount to begging, 'please don't make us tell everyone how much sugar we dump on our garbage bog berries.'"